Friday, November 2, 2018: RSBN’s Max Kleiber and Bailee Byers will be on hand as President Donald J. Trump holds a campaign style rally at Southport High School in Indianapolis, IN. President Trump is expected to speak at 7:00 PM ET. You could also watch the rally on RSBN YouTube and chat on the right margin. If you missed Trump rallies (since 2016), visit RSBN YouTube. Trump will hold several rallies each week through midterm elections – Nov. 6, 2018. Democrat Debbie Wasserman Schultz, a sitting U.S. Congresswoman and vice chairwoman of the Democratic National Committee, led a protest in front of the headquarters of Republican candidate Allen West, a Tea Party favorite, who was running against Democrat Ron Klein for Florida’s 22nd congressional district. Wasserman Schultz also peddled lies against Tea Partiers: When asked what is the difference between her protest and the Tea Party protest, the Democrat congresswoman said, “Our protest is different because I don’t see any swastikas or any pictures of the president in black-face or burned in effigy here,” implying that Tea Partiers are racists and extremists. (She probably was confusing the Tea Partiers with leftists calling for the death of President Bush.) She also said that one protester at a community meeting she hosted “shouted from the courtyard that I deserved breast cancer” because she supported the health care law. As a typical leftist, Wasserman Schultz did not provide any evidence to substantiate her accusations. Here is the video of her speech. The “Cut, Cap and Balance” bill makes no changes to Social Security or Medicare. Most of the cuts in the bill come from discretionary spending, anyway, but the bill specifies that the $35 billion cuts to mandatory spending would come from non-veterans, non-Social Security, non-Medicare spending. Following are some Tea Party videos and photos. 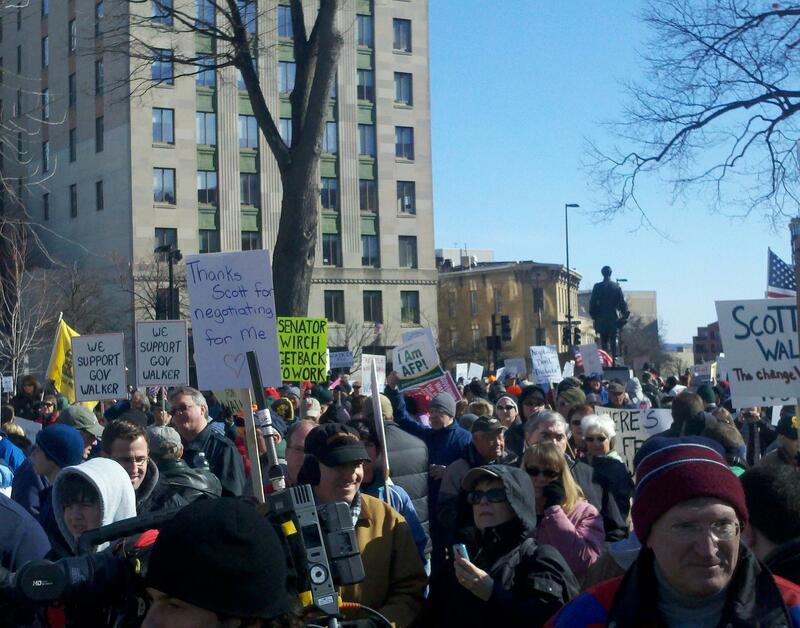 Note that those images were taken to record the protests and not to prove that Tea Parties are diverse. Wisconsin is ground zero in the fight against the public-sector unions that are bankrupting our country. 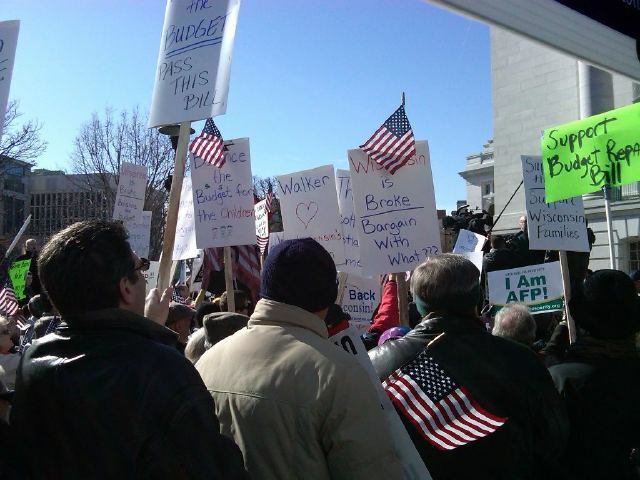 Tea Party patriots, American Majority, Andrew Breitbart, GatewayPundit, American For Prosperity and others are in Madison today to support Gov. 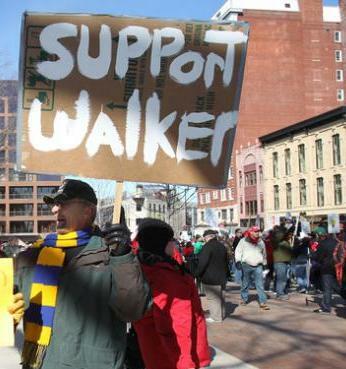 Scott Walker’s budget cuts. Time: Saturday, February 19, 2011, starting at 12:00 noon. Location: Wisconsin State Capitol, South Steps. Liberals manufacture these type of stupid controversies because they don’t want Americans to listen to the conservative message like Bachmann’s. We cannot allow liberals to continue re-writing the facts. DID CNN OR FOX NEWS SABOTAGE REP. BACHMANN’S SOTU RESPONSE? On 1/21/2011, the Daily Caller reported that Bachmann’s speech “will be broadcast online and sponsored by Tea Party Express, a California-based political action committee…” The Tea Party Express also indicated so in an e-mail to their supporters. 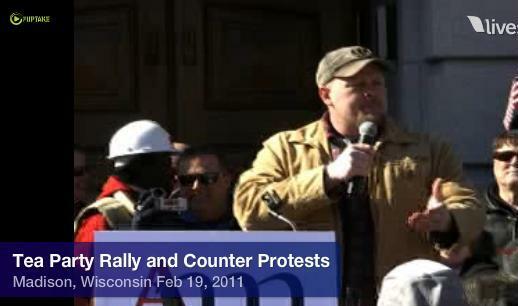 The blogger TheRightScoop posted the Tea Party video the next day after Bachmann’s speech. So, why didn’t the major networks use the correct video during their trashing analysis of Bachmann’s SOTU response. 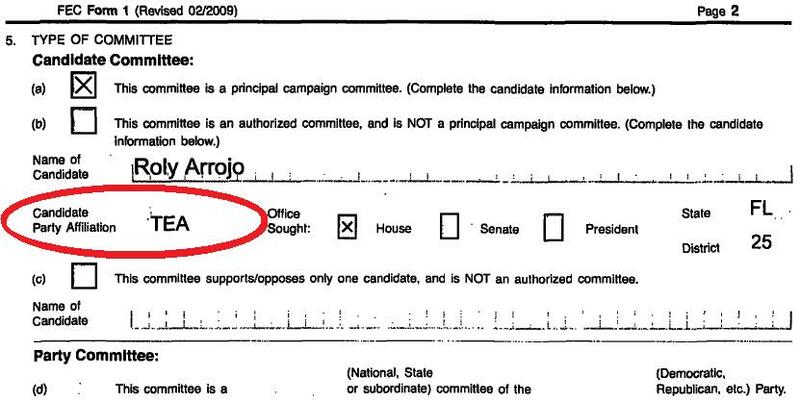 Here are the public campaign records proving that Roly Arrojo is a Democrat, but he wants voters to think he is representing the Tea-Party-Movement. Informed voters know that the “Tea Party” is not a political party, but a movement or loosely affiliated smaller local groups composed by every-day Americans who care about the U.S. Constitution and oppose government waste and abuse. The name “Tea Party” alludes to the historical Boston Tea Party of 1773 when Americans protested the British monarchy and their taxation. Besides the two leading candidates for Florida’s 25th congressional district Republican David Rivera and Democrat Joe Garcia, there is a third candidate – Roly Arrojo (a.k.a. Jose Rolanndo Arrojo) who is still a mystery. He has no campaign website and no campaign funds. He submitted documents to the Federal Election Commission (FEC) as a Democrat. Later he filed a paper indicating his party affiliation as TEA. There are also reports that Roly Arrojo has links to the Democrat candidate Joe Garcia. Go to Florida Division of Elections, then type his last name to get his public records. 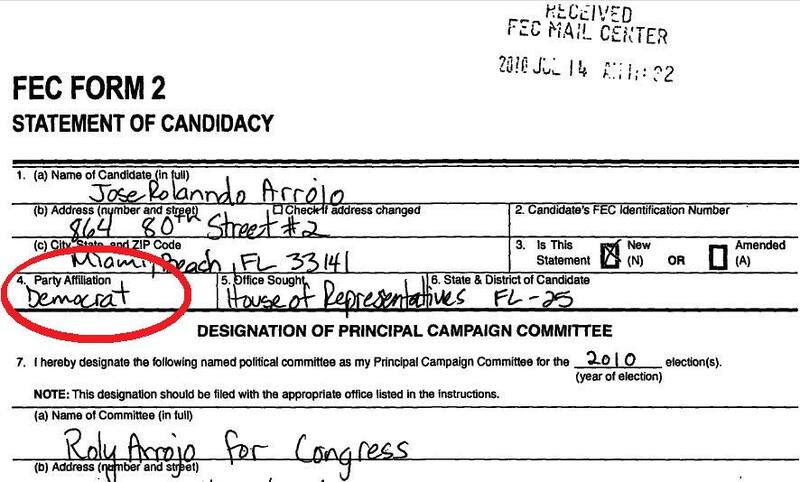 In a review of public records, The Herald found Arrojo and Jeffrey Garcia, Joe Garcia’s campaign manager, listed as managing members of Project Mercury, a Miami Beach-based real estate management and procurement company registered in Florida in 2005. Jeffrey Garcia, who is not related to his boss, resigned from Project Mercury. Miami-Dade County records also show Garcia owned property in Miami’s Upper Eastside with Arrojo and his wife, Michelle. The trio purchased the property for $775,000 in 2005 and sold it for $256,750 in May. He has not done much campaigning, Arrojo said, because he has been traveling. “I hope to have a website soon and will reach out to voters in the coming months,” he wrote. Though Arrojo has not submitted any campaign finance reports, state elections records show he paid the $10,440 candidate qualifying fee. He has also not filed financial disclosures with the House, which can fine candidates $200 if they send in the paperwork — due last May 15 — more than 30 days late. – OpenSecrets, which tracks money in politics, has no record for Roly Arrojo. – Federal Election Commission shows zero donations to Arrojo’s campaign. – Orlando Tea Party: Roly Arrojo is a fake Tea Party candidate.